One of the sponsors of a New Hampshire bill demanding insurers reimburse auto body shops for any OEM procedures said Wednesday the measure was meant to cover instructions for fixing cars and not automaker guidance on parts. House Bill 664 built upon the work of a New Hampshire legislative committee tasked with studying collision repair reimbursement in the state. Their Nov. 1, 2018, report made little mention of OEM repair procedures, but it did devote a significant portion to collision repairers’ complaints about aftermarket parts. HB 664 would add to state law language declaring “An insurer shall reimburse a repairer for all repairs if a repairer follows original equipment manufacturer recommended collision repair procedures, recommendations, or service bulletins while repairing a vehicle. ” The law would kick in 60 days after passage. a. Prohibit insurers from requiring any repair procedure that is contrary to original equipment manufacturer (OEM) procedures. “My view is the bill deals with repair instructions,” Williams, who also serves as vice chairman of the House Commerce and Consumer Affairs Committee hearing his bill now, wrote in an email Wednesday. “We heard from shops that they were told by adjusters to not follow OEM repair procedures in some cases, instead told to do a simpler procedure. They were concerned that the result would not be safe, and would not result in ‘pre-loss condition’. Last year, opponents challenged a Rhode Island bill banning insurers from demanding shops deviate from OEM repair procedures by arguing adherence would ban the use of recycled and aftermarket parts. Many automakers have issued position statements recommending only new OEM parts be used in repairs. The bill ultimately became law, but a rewrite to address this controversy muddled its language. The Alliance of Automobile Manufacturers in December 2018 said it and the ASA would this pursue legislation barring insurers from requesting deviations from OEM repair procedures but allow an exception in the case of parts. In addition, under RSA 407-D, which was adopted in 1988, insurers are prohibited from requiring the use of after market parts in a repair unless the part is “at least equal in like kind and quality to the original part in terms of fit, quality and performance.” This law defines ‘after market part’ as “sheet metal or plastic parts which generally constitute the exterior of a motor vehicle, including inner and outer panels.” This definition does not include vehicle glass. Independent repair shop owners are frustrated by their sense that insurance companies dictate how, and with which parts, a vehicle is to be repaired. They report that after market parts are not always of like kind and quality. For example, they may not fit in the vehicle without being forced or the bolt holes may not line up with holes in the vehicle frame. Any alteration to the part to make it fit compromises the integrity of the part. 3. At times insurers require the use of inferior after market parts for a covered repair. This compromises the safety of the vehicle and can be a contributing factor in a second accident, leading to further damages, potential physical harm to people and necessitating further repairs at more expense. The Insurance Institute for Highway Safety, which supports aftermarket parts and has conducted its own crash testing reinforcing this view, agreed that some imitation parts don’t deliver sufficient quality. The Certified Aftermarket Parts Association in 2012 reported research that 14 out of the 15 uncertified aftermarket parts it tested flunked, and it has through Wednesday decertified 810 parts which couldn’t continuously meet the CAPA standards. Avoiding the parts issue and focusing on procedures ought to remove the opposition seen in Rhode Island from entities like the Auto Care Association, LKQ and Automotive Recyclers Association from hearings on the New Hampshire bill and the other legislation planned by the two national trade groups. However, lawmakers might want to take care with their language on such bills to encapsulate situations where an OEM doesn’t merely issue a general position statement about all imitation, recycled or refurbished parts but takes a stance on a specific part. According to the committee, glass has been given a pass on the like, kind and quality issue. But the existence of advanced driver assistance systems — safety features often involve a window-mounted camera — and head-up displays projected on the windshield have led to OEMs taking a hard line on imitation glass. Automakers tend to forbid any wheel refurbishing outside of refinishing. Porsche bans all of it outright. Situations also exist where a specific material or part is required in vehicle repair procedures, such as an adhesive or fluid. Of course, the repairer can always refuse to compromise quality or safety on such matters and bill the customer out-of-pocket if the insurer refuses to budge on parts. Another option might be simply for shops to demonstrate the absence of “like kind and quality” — as a shop owner in neighboring Vermont did with a hardness tester — or demand proof that the part matches all internal OEM quality targets. The insurer by law is limited to parts which deliver “like kind and quality,” after all. 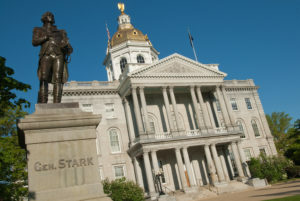 Be heard: Contact information for New Hampshire lawmakers can be found here and here.